Who are the real terrorists in this war on terror ? 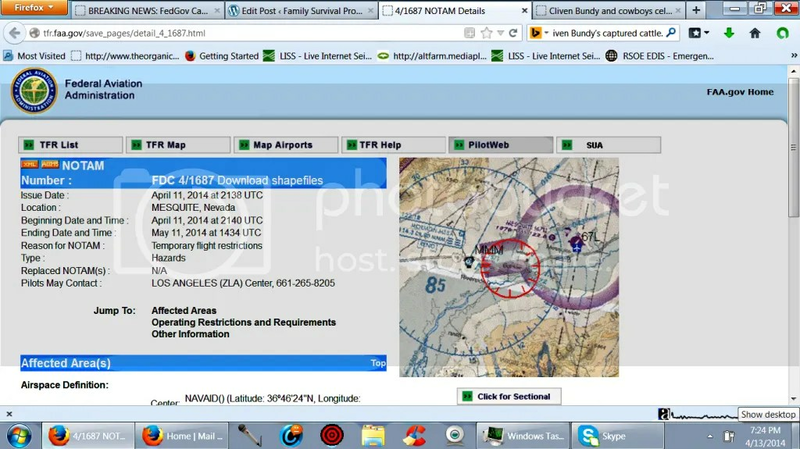 Report states : The ambush on the Russian U-24 bomber was guided by the US and Saudi Airforce. The American E-3A was supposed to determine the activity of the Su-24M2′s onboard targeting radar, to determine if it was in search mode or if it had already locked on to a target and was processing launch-data. It is known that the AWACS can direct the activity of aircraft in battle, conveying information to their avionics and flight computers. ATHENS, December 2. /TASS/. 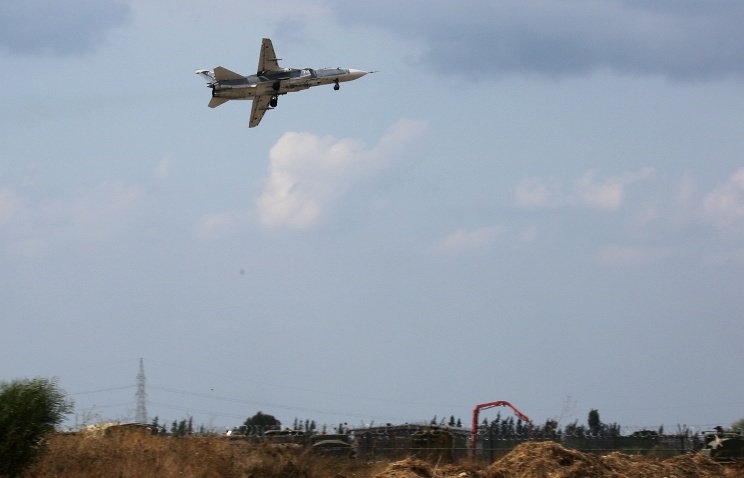 The Russian Sukhoi Su-24M bomber was brought down by the Turkish Air Force in Syrian airspace, Greek Minister of National Defense Panos Kammenos said in an interview to the Mega TV channel on Wednesday. Asked which side Greece should take, as a NATO member, the minister said – “the truth”. “If Russia had violated Turkish airspace, we would support Ankara”, the defense minister said. Turkey’s F-16 fighter that shot down the Russian Aerospace Forces’ Sukhoi Su-24M bomber was in Syria’s airspace for 40 seconds and went inside its territory by 2 kilometers, while the Russian bomber did not violate the Turkish state border, the commander-in-chief of the Russian Aerospace Forces, Viktor Bondarev, said on November 27. 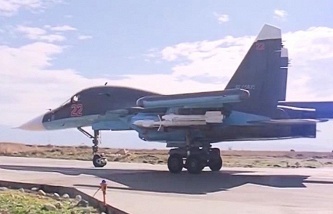 “In line with air defense means objective control materials, the Turkish plane was in Syria’s airspace for 40 seconds and flew two kilometres inside its territory, whereas the Russian bomber did not violate the state border of Turkey,” Bondarev said. He said the crew of the second Su-24 plane confirmed the launch of the missile from the F-16. After the combat employment at the mentioned target and left turn to 130-degree course “it observed on the left side of it flame and a tail of white smoke, which it reported to the flight operations director,” he said. Saudi Arabia’s warplanes are targeting own population with cluster bombs in a desperate move to stop Yemeni forces inside the kingdom. TEHRAN (FNA)- Saudi Arabia’s warplanes are targeting the Southern parts of the kingdom with cluster bombs in a bid to stop the Yemeni army and popular forces’ continued and rapid advance deep into their territories. Saudi Arabia has used cluster bombs many times before, but this is the first time that it is using it against its own population in a desperate move to stop the huge advances made by the Yemeni forces inside the kingdom in recent days. A cyclist rides past a burned Ukrainian army vehicle in the eastern Ukrainian village of Oktyabrskoe, near Kramatorsk, on May 14, 2014. The prevailing crisis in Ukraine following a US-backed coup will remain a stain on the reputation of Western governments, an analyst writes in a column for the Press TV website. “The killings in East Ukraine by sending in the Right Sector thugs to do the dirty work will be remembered as an example of Western moral bankruptcy,” Jim W. Dean wrote. He stated that the US Central Intelligence Agency (CIA) and the coup government in Kiev organized a “stupid anti-terror operation” which led to dozens of deaths in the southern city of Odessa on May 2. 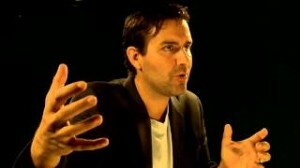 The analyst said the Western governments “have made fools of themselves” in the eyes of people. [Update: Our VT crisis team analysis concluded that the photographic evidence showed the inconsistent burn injuries to be indicative of obscuring how and what was used to kill many of these people. The only options really on the table was lethal gas, and we surmized Vx…something that lung tissue analysis would confirm or not. Witnesses reported bodies and people being herded into the basement, and then this dissapeared from the news. Not a word about “missing” people was mentioned by the Odessa authorities. And of course it is easy to have confusion here with witnesses hiding out who would like to stay alive. Despite all the witnesses to building escapees being beaten to death by the Right Sector mob, Kiev preferred to give tag them as “jumpers”. 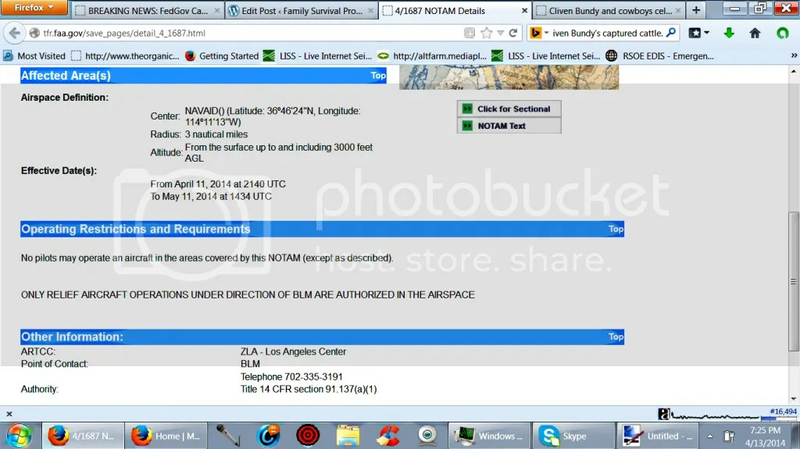 Of course on a frame of video of a jumped has emerged. I wonder why? Debating Russia: Solution to Ukraine’s crisis – partners, not enemies? A new alliance of lawmakers and citizens – Their mission: to wrest control over the vast expanses of land and wealth in the region that are unconstitutionally claimed by the Washington, D.C.-based political and bureaucratic classes. James Petras : Documenting the scale and scope of US military aid buttressing the “remaking of the Middle East” into a chain of political prisons run by and for the US Empire. During the beginning of his first term in office President Obama promised “to remake the Middle East into a region of prosperity and freedom”. Six years later the reality is totally the contrary: the Middle East is ruled by despotic regimes whose jails are overflowing with political prisoners. The vast majority of pro-democracy activists who have been incarcerated, have been subject to harsh torture and are serving long prison sentences. The rulers lack legitimacy, having seized power and maintained their rule through a centralized police state and military repression.Direct US military and CIA intervention, massive shipments of arms,military bases, training missions and Special Forces are decisive in the construction of the Gulag chain from North Africa to the Gulf States. We will proceed by documenting the scale and scope of political repression in each US backed police state. We will then describe the scale and scope of US military aid buttressing the “remaking of the Middle East” into a chain of political prisons run by and for the US Empire. The countries and regimes include Egypt, Israel, Saudi Arabia, Bahrain, Iraq, Yemen, Jordan and Turkey . . . all of which promote and defend US imperial interests against the pro-democracy majority, represented by their independent social-political movements. subsequent to seizing power. According to the Egyptian Center for Social and Economic Rights, between July and December 2013, 21,317 pro-democracy demonstrators were arrested. As of April 2014, over 16,000 political prisoners are incarcerated. Most have been tortured. The summary trials, by kangaroo courts, have resulted in death sentences for hundreds and long prison terms for most. The Obama regime has refused to call the military’s overthrow of the democratically elected Morsi government a coup in order to continue providing military aid to the junta.In exchange the military dictatorship continues to back the Israeli blockade of Gaza and support US military operations throughout the Middle East. Israel, whose supporters in the US dub it the “only democracy in the Middle East”, is in fact the largest jailer in the region. According to the Israeli human rights group B’Tselm, between 1967 and December 2012, 800,000 Palestinians have been imprisoned at some point, over 20% of the population. Over 100,000 have been held in “administrative detention” without charges or trial. Almost all have been tortured and brutalized. Currently Israel has 4,881 political prisoners in jail. What makes the Jewish state God’s chosen… premier jailer, however, is the holding of 1.82 million Palestinians living in Gaza in a virtual open air prison. Israel restricts travel, trade, fishing, building , manufacturing and farming through air, sea and ground policing and blockades. In addition, 2.7 million Palestinians in the Occupied Territories (West Bank) are surrounded by prison-like walls, subject to daily military incursions, arbitrary arrests and violent assaults by the Israeli armed forces and Jewish vigilante settlers engaged in perpetual dispossession of Palestinian inhabitants. According to President Obama’s ‘remaking of Middle East’ Saudi Arabia stands as Washington’s “staunchest ally in the Arab world”. 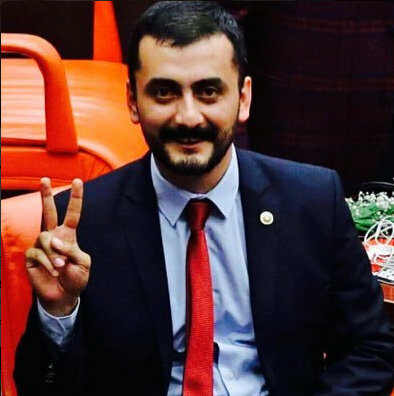 As a loyal vassal state, its jails overflow with pro-democracy dissidents incarcerated for seeking free elections, civil liberties and an end to misogynist policies. According to the Islamic Human Rights Commission the Saudis are holding 30,000 political prisoners, most arbitrarily detained without charges or trial. The Saudi dictatorship plays a major role bankrolling police state regimes throughout the region. They have poured $15 billion into the coffers of the Egyptian junta subsequent to the military coup, as a reward for its massive bloody purge of elected officials and their pro-democracy supporters. Saudi Arabia plays a big role in sustaining Washington’s dominance, by financing and arming ‘jailer-regimes’ in Pakistan, Yemen, Bahrain, Jordan and Egypt. According to the local respected Center for Human Rights, Bahrain has the dubious distinction of being the “top country globally in the number of political prisoners per capita”. According to the Economist (4/2/14) Bahrain has 4,000 political prisoners out of a population of 750,000. According to the Pentagon, Bahrain’s absolutist dictatorship plays a vital role in providing the US with air and maritime bases, for attacking Iraq, Iran and Afghanistan. The majority of pro-democracy dissidents are jailed for seeking to end vassalage , autocracy, and servility to US imperial interest and the Saudi dictatorship. Beginning with the US invasion and occupation of Iraq in 2003 and continuing under its proxy vassal Prime Minister Nouri Al-Maliki, tens of thousands of Iraqi citizens have been tortured, jailed and murdered. Iraq’s ruling junta, has continued to rely on US military and Special Forces and to engage in the same kinds of military and police ‘sweeps’ which eviscerate any democratic pretensions. Al-Maliki relies on special branches of his secret police, the notorious Brigade 56, to assault opposition communities and dissident strongholds. Both the Shi’a regime and Sunni opposition engage in ongoing terror-warfare. Both have served as close collaborators with Washington at different moments. The weekly death toll runs in the hundreds. The Al-Maliki regime has taken over the torture centers (including Abu Ghraib), techniques and jails previously headed and run by the US and have retained US ‘Special Forces’ advisers, overseeing the round-up of human rights critics, trade unionists and democratic dissidents. Yemen has been ruled by US-Saudi client dictators for decades. The autocratic rule of Ali Abdullah Saleh was accompanied by the jailing and torture of thousands of pro-democracy activists, secular and religious, as well as serving as a clandestine torture center for political dissidents kidnapped and transported by the CIA under its so-called “rendition” program. In 2011 despite prolonged and violent repression by the US backed Saleh regime, a mass rebellion exploded threatening the existence of the state and its ties to the US and Saudi regimes. In order to preserve their dominance and ties to the military, Washington and Saudi orchestrated a ‘reshuffle’ of the regime: rigged elections were held and one Abdo Rabbo Mansour Hadi, a loyal crony of Saleh and servant of Washington, took power. Hadi continued where Saleh left off: kidnapping, torturing, killing pro-democracy protestors… Washington chose to call Hadi’s rule “a transition to democracy”. According to the Yemen Times (4/5/14) over 3,000 political prisoners fill the Yemen prisons. “Jailhouse democracy” serves to consolidate the US military presence in the Arabian Peninsula. For over a half century, three generations of reigning Jordanian absolutist monarchs have been on the CIA payroll and have served US interests in the Middle East. Jordan’s vassal rulers savage Arab nationalists and Palestinian resistance movements; signed off on a so-called “peace agreement” with Israel to repress any cross-border support for Palestine; provide military bases in support of US, Saudi and EU training, arming and financing of mercenaries invading Syria. The corrupt monarchy and its crony oligarchy oversee an economy perpetually dependent on foreign subsidies to keep it afloat: unemployment is running over 25% and half the population is subsisting in poverty. The regime has jailed thousands of peaceful protestors. According to a recent Amnesty International Report (Jordan 2013), King Abdullah’s dictatorship “has detained thousands without charges”. The jailhouse monarchy plays a central role in buttressing US empire-building in the Middle East and facilitating Israeli land grabbing in Palestine. Under the reign of the self-styled “Justice and Development Party” led by Tayyip Erdoğan, Turkey has evolved into a major military operational base for the NATO backed invasion of Syria. Erdoğan has had his differences with the US; especially Turkey’s cooling relations with Israel over the latters’ seizure of a Turkish ship in international waters and the slaughter of nine unarmed Turkish humanitarian activists. But as Turkey has turned toward greater dependence on international capital flows and integration into NATO’s international wars, Erdoğan has become more authoritarian. Facing large scale public challenges to his arbitrary privatization of public spaces and dispossession of households in working class neighborhoods, Erdoğan launched a purge of civil society ,class based movements and state institutions. In the face of large scale pro-democracy demonstrations in the summer of 2013, Erdoğan launched a savage assault on the dissidents. According to human rights groups over 5,000 were arrested and 8,000 were injured during the Gezi Park protests. Earlier Erdoğan established “Special Authorized Courts” which organized political show trials based on falsified evidence which facilitated the arrest and imprisonment of hundreds of military officers, party activists, trade unionists, human rights lawyers and journalists, particularly those critical of his support for the war against Syria. Despite conciliatory rhetoric, Erdogan’s jails contain several thousand Kurdish dissidents, including electoral activists and legislators (Global Views 10/17/12). Government Selling Off America : The standoff between the Bureau of Land Management (BLM) and Nevada cattle rancher Cliven Bundy is about much more than grazing rights. It’s really about sweetheart deals for federal land. BLM Confiscating Land to Back Currency With After Coming Hyperinflation? In an April 9 opinion piece published in the Washington Post, commentator George Will praises the Goldwater Institute’s Compact for America and its component calling for an Article V constitutional convention. Will points out a few of the proposal’s “benefits,” insisting that the balanced budget amendment (BBA) that it aims to enact “delivers immediate benefits to constituents.” Unfortunately, Will’s analysis of the Compact for America ignores several of its distinctly unconstitutional provisions. First, before state legislatures vote for an Article V con-con proposal such as the Compact for America that could cause real and radical damage to our Constitution, they should first consider whether a balanced budget amendment is necessary and whether it would actually repair the damage already done by a Congress committed to ignoring the constitutional limits on its power. The fact is that determined citizens and state legislators could rescue the United States from its financial peril without resorting to opening up the Constitution to tinkering by 38 or more state-appointed delegates, many of whom would be bought and paid for by special interests and corporations. Imagine for a moment the brand of “conservative” delegates that might be chosen by state partisans to represent them at an Article V convention. It isn’t unlikely that Arizona might choose John McCain, Jan Brewer, or Sandra Day O’Connor. 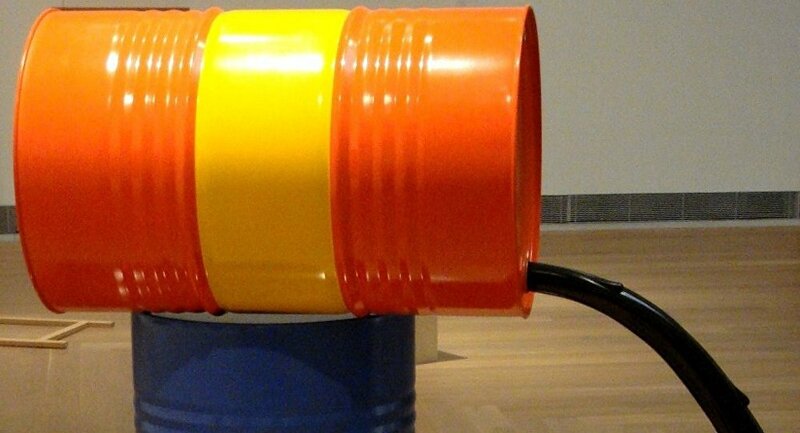 New York might send Michael Bloomberg. South Carolina could appoint Lindsey Graham. Similar selections could be predicted in every state. Next, there is no historical proof that a balanced budget amendment would drive Congress back to within its constitutional corral. Even the most conservative estimates indicate that about 80 percent of expenditures approved by Congress violate the U.S. Constitution. That fact wouldn’t change by adding an amendment to the Constitution. Whether these bills spend our national treasure on unconstitutional and undeclared foreign wars, billions sent overseas in the form of foreign aid, expanding the so-called entitlement programs, or redistributing wealth via corporate and individual welfare schemes, none of these outlays is authorized by the Constitution. And don’t forget, a committed, concerned, and constitutionally aware citizenry can balance our budget more quickly than any balanced budget amendment and without the danger of letting the wolves of special interests and their political puppets into the constitutional hen house. Third, rather than forcing Congress to adhere to spending money in only those areas specifically permitted by the Constitution in Article I, the Compact for America’s Balanced Budget Amendment specifically allows Congress to spend money on anything, no matter how unconstitutional, so long as the amount does not exceed the limits set in Section 2 of their BBA. If approved, the CFA’s BBA would do nothing to break Congress of its unconstitutional spending habits, habits that have nearly ruined the economic might of this Republic. In fact, under the CFA’s budget-balancing scheme, Congress could continue spending on projects and programs not authorized by the Constitution. Section 3 of the CFA’s BBA explicitly authorizes an increase in the federal debt limit to 105 percent of the actual debt level on the effective date of this amendment. That hardly sounds like a balanced budget and is not something true conservatives should support as a remedy to a runaway federal government. Or Adding A National Sales Tax To The Income Tax? When 2/3 of the States apply for it, Congress calls a convention to propose amendments. A: That is what the people pushing for an Article V convention now call it. Nick Dranias, Esq., of the Compact for America, Inc., whose “balanced budget” amendment imposes a new national sales or VAT tax on the American People. Nullification denier and birther denier, Mark Levin, Esq., whose “balanced budget” amendment legalizes Congress’ unconstitutional spending and does nothing to control the debt. A: Only amendments require ratification by ¾ of the States (see Art. V). But a new constitution would have its own new method of ratification – it can be whatever the drafters want. For example, the proposed Constitution for the Newstates of America is ratified by a referendum called by the President. Mark Levin’s Liberty Amendments: Legalizing Tyranny? Interesting how Americans standing their ground and fighting back against an out of control government and their jackboot thuggery are violating the law. Yet the Politicians with their L.E. thugs who lie, steal , cheat and abuse the American People everyday are law abiding ? Perhaps it is time to teach these self aggrandized public servants what Americans are capable of and just who they truly work for!! You are right about one thing Mr. Reid, this is definitely not Over……..
“last rancher standing” in Clark County, due to a decades-long campaign by federal agencies and allied enviro-activists to drive all ranchers off of the range. 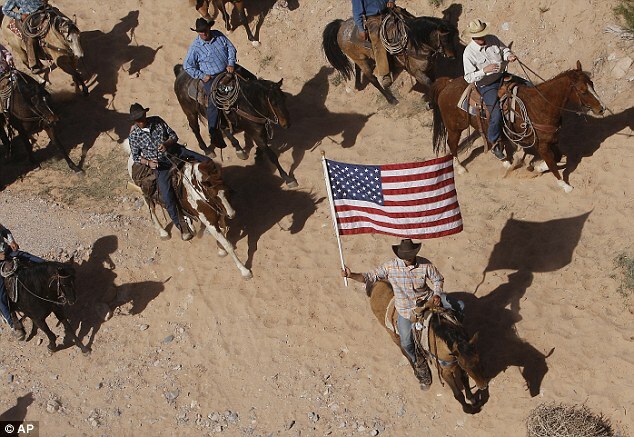 After a tense standoff, orders came down from above for the surrounded and outnumbered federal agents to “stand down” and turn loose the Bundy cattle that had been corralled. Former Texas Rep. Ron Paul was on “Your World” this afternoon to discuss the battle between a Nevada rancher and the federal government. The federal government says Cliven Bundy owes $1 million in grazing fees, and authorities seized many of his cattle. 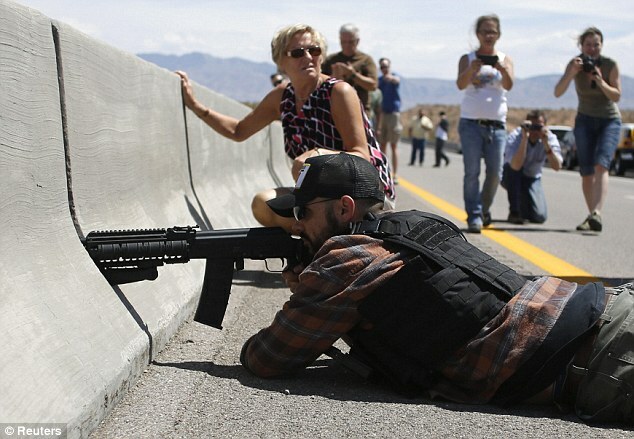 Bundy then declared a “range war” on the government, prompting a standoff between Bundy’s supporters and the government. The government has since pulled back. Paul said the government could come back with more force because it doesn’t give up power easily, citing the 1993 siege of the Branch Davidians’ compound in Waco, Texas. He said this issue poses the question of who should own the land. 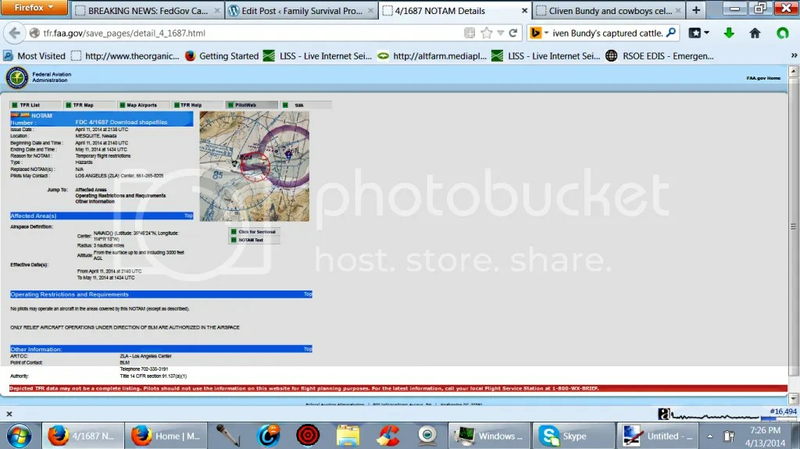 Paul said Bundy has virtual ownership of the land because his family has been using it for so long. Hear more of Paul’s thoughts in the video above. 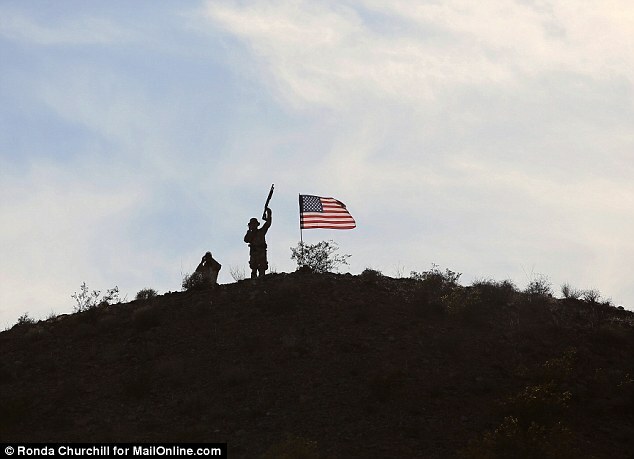 State Senate President Andy Biggs and House of Reps Speaker Dave Livingston have both agreed that Arizona should be involved in supporting CSPOA and Oath Keepers in going to Bunkerville, NV to support the movement for freedom there with the Cliven Bundy family. State Senators Al Melvin, Chester Crandall, and Kelly Ward along with State Reps Brenda Barton, Bob Thorpe, Kelly Townsend and Warren Peterson are all planning to be at the Bundy ranch by Sunday morning. Furthermore, they all plan to attend the Press Conference Monday afternoon with the CSPOA and Oath Keepers along with the Bundys and other sheriffs and public officials from across the country. We hope you understand how HUGE this is, that state senators and reps are supporting the CSPOA and the Oath Keepers! We are not alone! The courage and resolve displayed by Ammon Bundy and his relatives is inspiring, and may well go down in history as a watershed moment – a turning of the tide. But the above video also amply demonstrates the heavy-handed behavior of the BLM that risks escalating an already volatile situation into open bloodshed, that, once begun, may spiral out of anyone’s control. 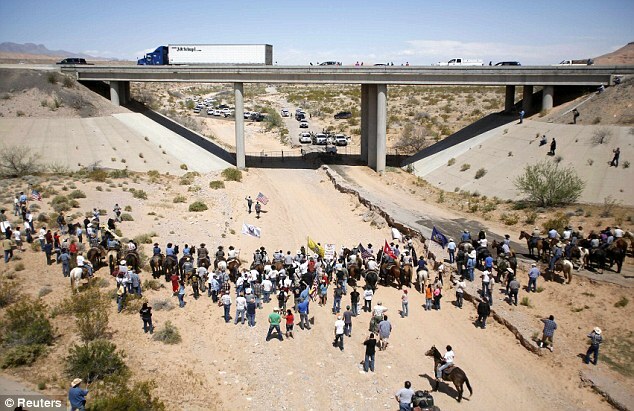 It is necessary that current serving public servants step in-between the protesters and the BLM, to protect the rights of the people and to prevent violence against them by the militarized federal law enforcement that are massing near the ranch to continue the forced confiscation (theft) of Bundy’s cattle, while they also restrict all access to huge tracts of public land, and attempt to restrict the free speech of protesters with their absurd “First Amendment Area” (which the protesters are ignoring, to their honor). 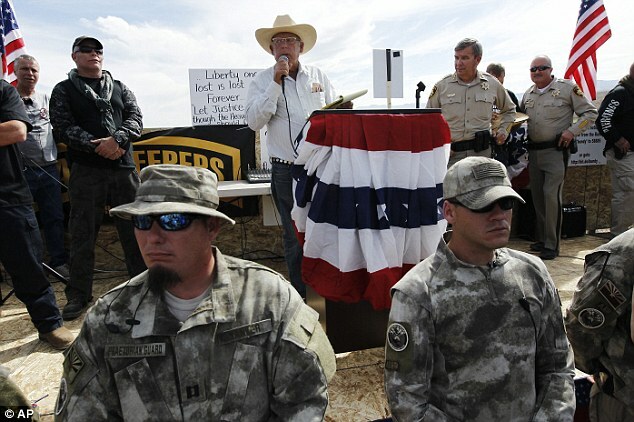 The Oath Keepers organization, comprised of 40,000 current serving and former military, police, and first responders, is also calling on its members and all other patriotic Americans to join the vigil at the Bundy ranch under the leadership of the current serving legislators and sheriffs. The goal is to have at least one current serving state legislator and at least one sheriff on the ground at all times until this is over. And they will be backed by a large number of military and police veterans, as well as dedicated patriotic Americans from all walks of life, to interpose and defend the rights of the protesters and to keep an eye on the actions of the BLM and any other federal law enforcement present, to prevent a recurrence of the horrid abuses seen at Ruby Ridge and Waco, and to hopefully pressure the Clark County Sheriff and the Nevada Governor to step up and do their constitutional duty. Regardless, please tell everyone you know to be praying for a peaceful resolution to this situation and for the safety of the brave patriots headed there and on the ground there right now. 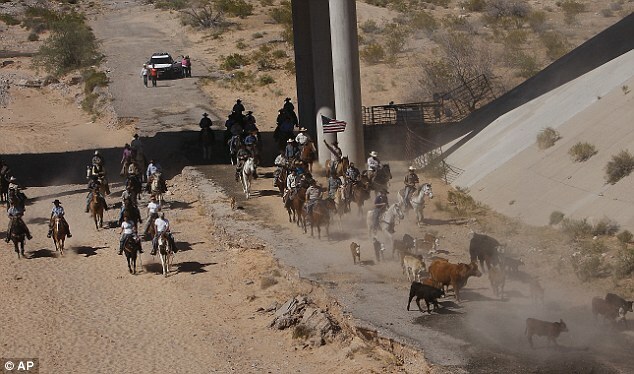 CLIVEN BUNDY’S WAR WITH FEDERAL GOVERNMENT NOT OVER YET 4-15-2014: Inside Source Claims Feds are PreparingTo Raid Bundy Ranch, Harry Reid Says “It’s Not Over”, Americans Have Drawn A Line In The Sand, Disarm The BLM, And Other Headline Summaries. If you haven’t been following the unfolding drama at the Bundy Ranch about 80 miles northeast of Las Vegas you need to start now. 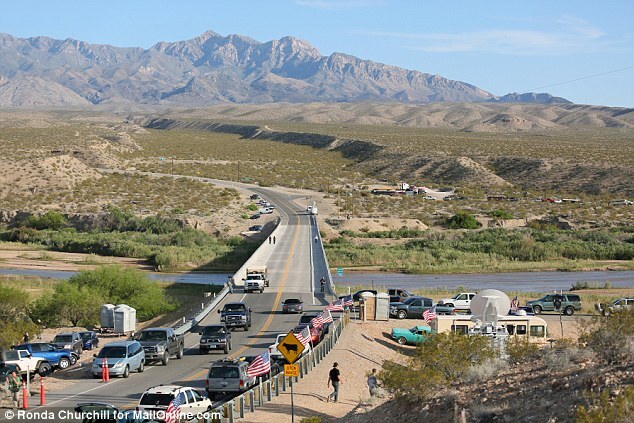 The escalating confrontation between irate local residents and federal agents of the Bureau of Land Management (BLM) has the potential to take a very dangerous turn for the worse at any moment, as hundreds of militia members from states across the country are expected to descend upon the area and make a stand with 67-year-old Nevada rancher Cliven Bundy. Before I get into any sort of analysis about what this means within the bigger picture of American politics and society, we need a little background on the situation. The saga itself has been ongoing for two decades and the issue at hand is whether or not Mr. Bundy can graze his 900 head of cattle on a particular section of public lands in Clark County. Cliven Bundy has been ordered to stop on environmental grounds to protect the desert tortoise, but he has stood his ground time and time again. As a result, the feds have now entered the area and are impounding his cattle. According to CNN, Between Saturday and Wednesday, contracted wranglers impounded a total of 352 cattle. 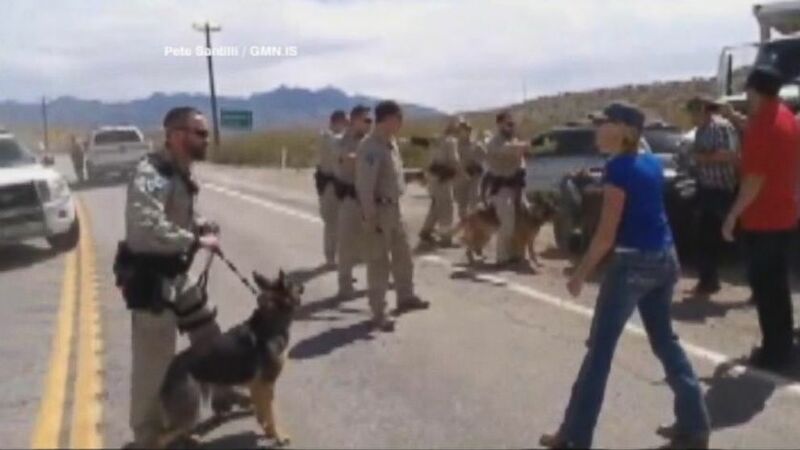 The Bundy family, as well as a variety of local residents have already had confrontations with the BLM agents. Tasers have been used and some minor injuries reported. Most significantly, militia members from across the country have already descended upon the area and it seems possible that hundreds may ultimately make it down there. To me, the argument of who is right and who is wrong in this situation is the least interesting part of the story. I have noted time and time again that the feds are becoming increasingly out of control and belligerent to American citizens. We know the stories (think Aaron Swartz) and we know the overall trend. However, the reason the Bundy Ranch confrontation is so interesting, is that for whatever reason this particular incident seems to be striking a chord of dissent. It is often times the most random, unforeseen and innocuous things that spark social/political movements. This standoff has it all. The fight involves a 600,000-acre area under BLM control called Gold Butte, near the Utah border. The is the habitat of the protected desert tortoise, and the land has been off-limits for cattle since 1998. Five years before that, when grazing was legal, Bundy stopped paying federal fees for the right. Bundy stopped paying grazing fees in 1993. He said he didn’t have to because his Mormon ancestors worked the land since the 1880s, giving him rights to the land. “We own this land,” he said, not the feds. He said he is willing to pay grazing fees but only to Clark County, not BLM. Nevada, where various federal agencies manage or control more than 80 percent of the land, is among several Western states where ranchers have challenged federal land ownership. Federal agents clash with armed protestors over a rancher’s 20-year tax fight. A Nevada cattle rancher appears to have won his week-long battle with the federal government over a controversial cattle roundup that had led to the arrest of several protesters. “It’s not about cows, it’s about freedom,” Utah resident Yonna Winget told ABC News affiliate KTNV in Las Vegas, Nevada. 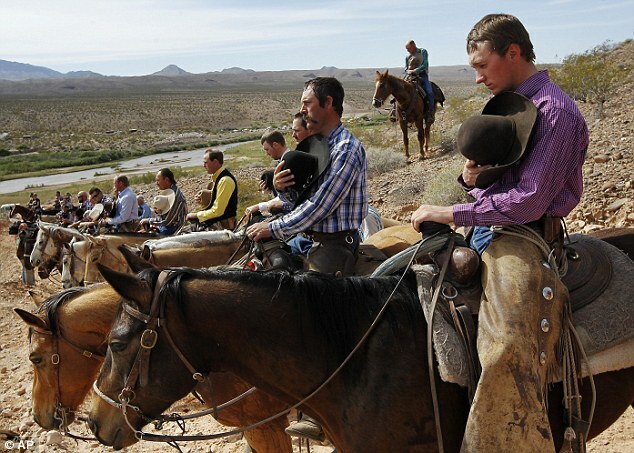 Hundreds of heavily armed militia members celebrated their victory over federal law enforcement officers on Saturday after they secured the release of Cliven Bundy’s captured cattle. 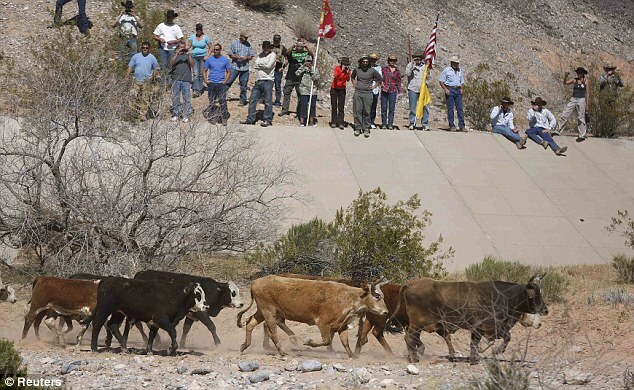 In an embarrassing climbdown, the Bureau of Land Management retreated from its high profile standoff with Bundy and his rag-tag bunch of anti-federalists after the BLM attempted to forcibly capture nearly 1,000 of his cattle. 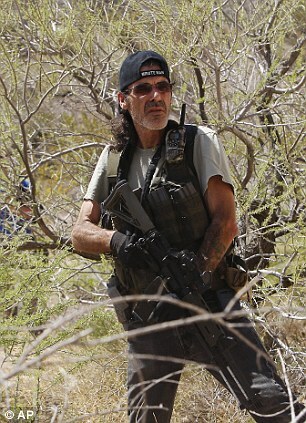 The militia member showed up at corrals outside Mesquite to demand the animals’ return to rancher Cliven Bundy. Some protesters were armed with handguns and rifles at the corrals and at an earlier nearby rally. 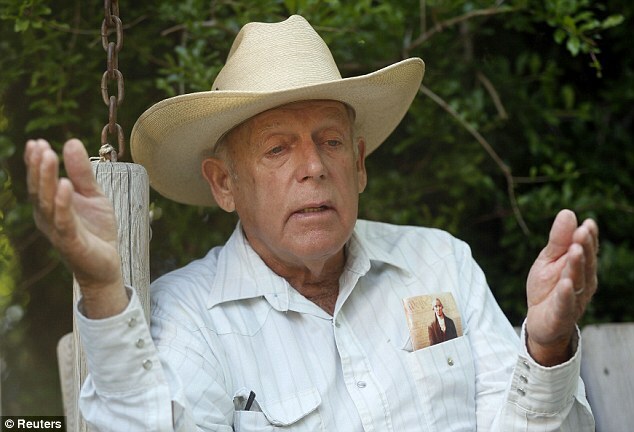 Bundy, 67, doesn’t recognize federal authority on land he insists belongs to Nevada. His Mormon family has operated a ranch since the 1870s near the small town of Bunkerville and the Utah and Arizona lines. 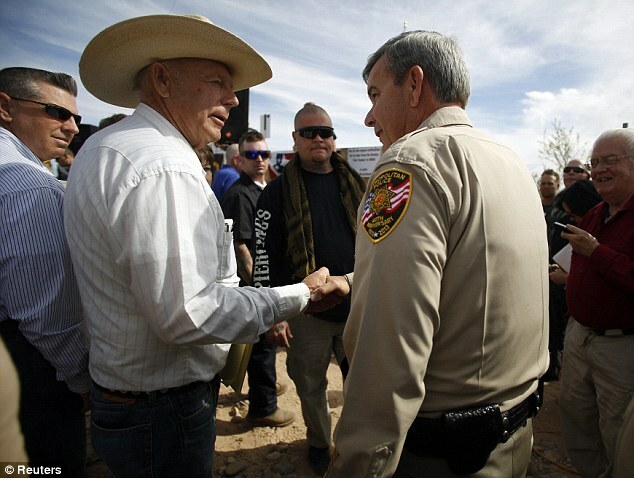 ‘Good morning America, good morning world, isn’t it a beautiful day in Bunkerville?’ Bundy told a cheering crowd after his cattle were released, according to the Las Vegas Review-Journal. ‘If we don’t show up everywhere, there is no reason to show up anywhere,’ said the man, dressed in camouflage pants and a black flak jacket crouched behind a concrete highway barrier, holding an AR-15 rifle. ‘I’m ready to pull the trigger if fired upon,’ Scott said. The dispute between Bundy and federal land managers began in 1993 when he stopped paying monthly fees of about $1.35 per cow-calf pair to graze public lands that are also home to imperiled animals such as the Mojave Desert tortoise. Land managers limited the Bundy herd to just 150 head on a land which the rancher claims has been in his family for more than 140 years. The government also claims Bundy has ignored cancellation of his grazing leases and defied federal court orders to remove his cattle. ‘We won the battle,’ said Ammon Bundy, one of the rancher’s sons. Hundreds of Bundy supporters, some heavily armed, had camped on the road leading to his ranch in a high desert spotted with sagebrush and mesquite trees. Some held signs reading ‘Americans united against government thugs,’ while others were calling the rally the ‘Battle of Bunkerville,’ a reference to a American Revolutionary War battle of Bunker Hill in Boston. The large crowd at one point blocked all traffic on Interstate 15. Later, as lanes opened up, motorists honked to support the demonstrators and gave them a thumbs-up sign. The fight between Bundy and the Bureau of Land Management widened into a debate about states’ rights and federal land-use policy. The dispute that ultimately triggered the roundup dates to 1993, when the bureau cited concern for the federally protected tortoise in the region. The bureau revoked Bundy’s grazing rights after he stopped paying grazing fees and disregarded federal court orders to remove his animals. Kornze’s announcement came after Bundy repeatedly promised to “do whatever it takes” to protect his property and after a string of raucous confrontations between his family members and supporters and federal agents during the weeklong operation. Bundy did not immediately respond to requests for comment. Republican Nevada Gov. Brian Sandoval issued a statement praising the agency for its willingness to listen to the state’s concerns. He earlier criticized the agency for creating “an atmosphere of intimidation” and trying to confine protesters to a fenced-in “First Amendment area” well away from the sprawling roundup area. ‘The safety of all individuals involved in this matter has been my highest priority,’ Sandoval said. Nevada’s congressional delegation urged the protesters to be calm and to leave the area. ‘The dispute is over, the BLM is leaving, but emotions and tensions are still near the boiling point, and we desperately need a peaceful conclusion to this conflict,’ U.S. Sen. Dean Heller, R-Nev., said in a statement. The 400 cows gathered during the roundup were short of the BLM’s goal of 900 cows that it says have been trespassing on U.S. land without required grazing permits for over 20 years. The dispute less than 80 miles northeast of Las Vegas between rancher Cliven Bundy and the U.S. Bureau of Land Management had simmered for days. Bundy had stopped paying fees for grazing his cattle on the government land and officials said he had ignored court orders. Anti-government groups, right-wing politicians and gun-rights activists camped around Bundy’s ranch to support him, in a standoff that tapped into long-simmering anger in Nevada and other Western states, where vast tracts of land are owned and governed by federal agencies. ‘Based on information about conditions on the ground and in consultation with law enforcement, we have made a decision to conclude the cattle gather because of our serious concern about the safety of employees and members of the public,’ the bureau’s director, Neil Kornze, said in a statement. After consultations with the rancher’s family, the bureau decided to release the cattle it had rounded up, and the crowd began to disperse. ‘This is what I prayed for,’ said Margaret Houston, one of Bundy’s sisters. ‘We are so proud of the American people for being here with us and standing with us. In an interview prior to the bureau’s announcement, Bundy said he was impressed by the level of support he had received. ‘I’m excited that we are really fighting for our freedom. 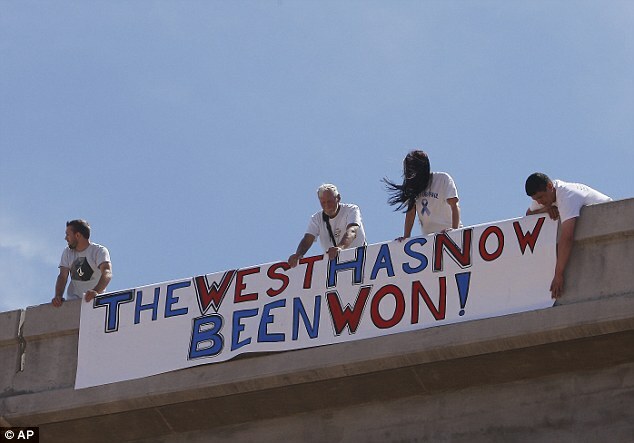 We’ve been losing it for a long time,’ Bundy said. 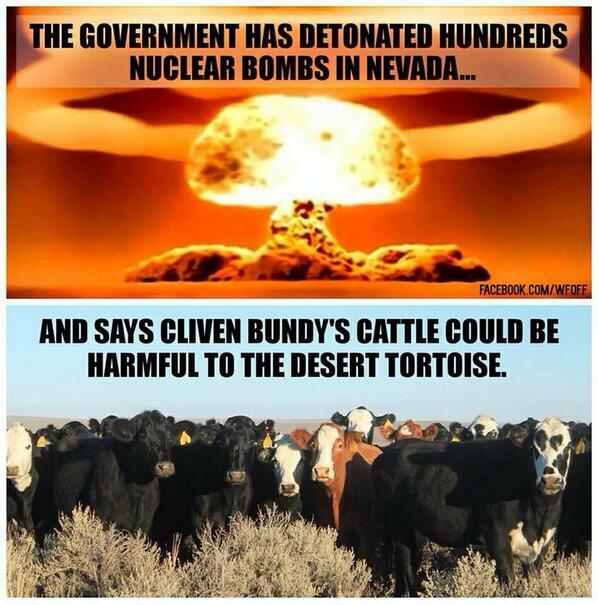 An official with an environmental group that had notified the government it would sue unless federal land managers sought to protect tortoises on the grazing allotment used by Bundy’s cattle expressed outrage at the end of the cattle roundup. Roger Taylor, retired district manager with the Bureau of Land Management in Arizona, also said the agency’s decision to release the cattle will have repercussions. ‘The (agency) is going to be in a worse situation where they will have a much more difficult time getting those cattle off the land and getting Bundy in compliance with regulations,’ he said. 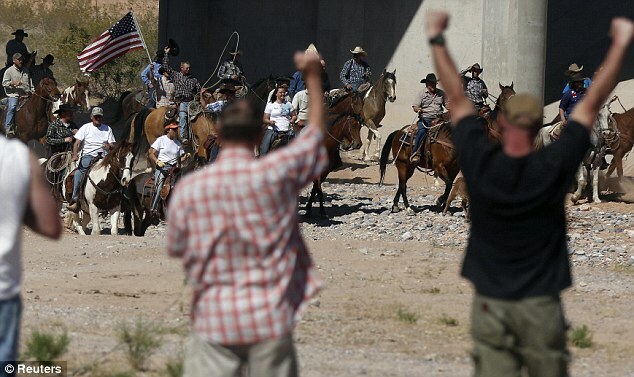 Bundy Ranch Showdown! The Bigger Picture!